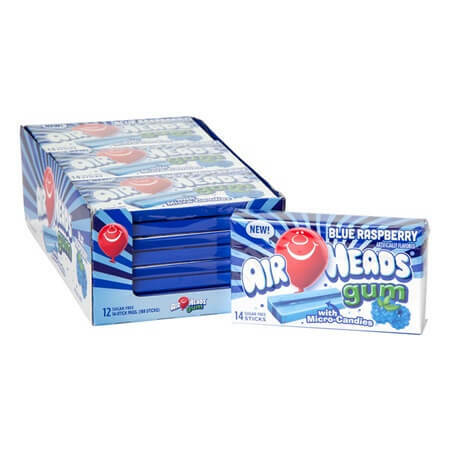 Airheads Sugar-Free Blue Raspberry Gum has micro-candies inside to amp up the flavor for a greater impact. Fourteen foil wrapped pieces of yummy gum are great to keep on hand as well as sharing. No more gum that loses its flavor after just a few seconds, now you can enjoy that great taste so much longer due to the increased flavor bursts from the tiny candies inside each wrapped piece. Sugar-free so those limited their sugar or cutting it out completely can enjoy each and every piece without an issue. 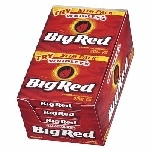 We also offer this sugar-free gum in both the watermelon flavor as well as the cherry flavor. 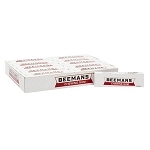 Stock up your gum racks with these fun new style gum sticks with longer lasting taste. 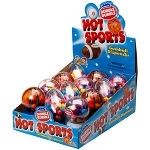 Place in gift baskets, or gift bags to send home from kids birthday parties for guests to enjoy long after the party is over. Order yours today for happy patrons! INGREDIENTS: (to show sweeteners used) Xylitol, Sorbitol, Chewing Gum Base, Glycerol, Maltitol Syrup, Contains Less Than 2% Of: Malic Acid, Artificial Flavors, Citric Acid, Tartaric Acid, Aspartame, Carrageenan, Coconut Fat, Sucralose, Lecithin (Soy), Acesulfame K, Sucrose Fatty Acid Esters, BHT To Maintain Freshness, Blue 1 Lake, Color (Carmines).